#InformedImages: "Rebecca," "The Passionate Friends," "Rear Window" and "Phantom Thread"
#InformedImages is a Free Cinema Now series that studies and brings to light influential films and other examples of moving images that informed and inspired specific visuals in later works. The two things that made the strongest impressions on me while watching Paul Thomas Anderson's Phantom Thread (read the review) were the music (by Jonny Greenwood) and the costume design (by Mark Bridges). You can practically feel the fabrics that dressmaker Reynolds Woodcock (Daniel Day-Lewis) cuts and and sews together throughout the film. Not to mention the fact that you can smell the soft boiled eggs and toast Reynolds has for breakfast every morning. The beautiful music keeps this all humming along splendidly. It really is an achievement in cinematic immersion. 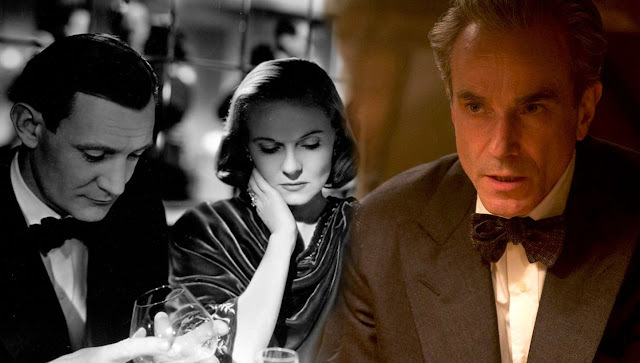 While the 1940 Oscar winner Rebecca has its fingerprints all over Phantom Thread, I wanted to bring to light a couple of other films whose heartbeats pulsate throughout Anderson's film: David Lean's 1949 drama The Passionate Friends and Alfred Hitchcock's 1954 thriller Rear Window. Lean's film shares more similarities to the high society looks and settings of Rebecca and Phantom Thread. Rear Window is the less obvious inspiration but it shares an important connection to Phantom Thread's theme of obsession (while also providing commentary on how physical ailment can sometimes reignite the romance between partners). At the end of the day, the entire point of the #InformedImages series is to provide insight into why filmmakers make the visual choices they do. It's not just another side-by-side exercise. In fact, most of the images in the #InformedImages series are hardly mirror images. Instead, the images speak to each other on an emotional and idea sharing level. See for yourself below. Watch: "Words and Love" Video Essay on "Arrival"
Review: "Film Stars Don't Die in Liverpool"
Watch: "Dunkirk In Real Time"